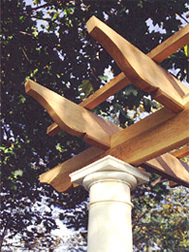 These garden structures, often called Tuscan Pergolas, come in a variety of column sizes, styles and materials. The pergolas can have either single or double beams depending on the column diameter. Rafter sizes depend upon the spans and are available with a variety of profiles. As with all of our garden pergolas, the rafters are notched to lock into the main beams. The number and size of purlins (the top layer) depends upon the amount of shade desired. For the column attachment we've developed a mechanism that has met the Florida code requirements for wind loads of 145 MPH. While the pricing for the Classic Column Pergola varies as to size and span requirements, generally the cost for this structure is between $45 and $55 per square foot. Specifics that affect the price are density of overhead structure, span distance of main beams and type of attachment to the foundations. 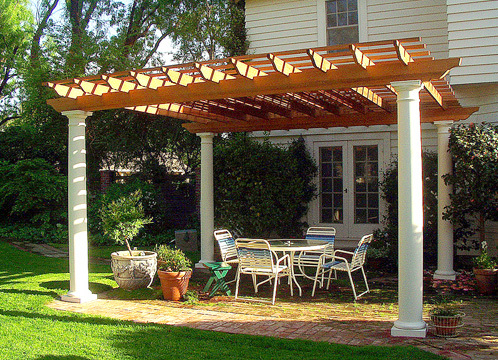 Several variables will need to be discussed with you in order to price your Classic Column Pergola. We will be happy to guide you through these questions. Please call 888-285-4624 with your size requirements and we will be able to quote a price for the Classic Column Pergola.